"Roots" is a work artist Susan Moir Mackay created for Transforming Spaces Art Exhibition in Nassau, Bahamas (March 24-25, 2012). Based on the theme of FIBRE (re-imagined indigenous), Ms. Mackay chose to use snipped hair from the community of people on break from working on the cruise ships docked in Port Lucaya. In total, 57 people contributed their hair to the project. 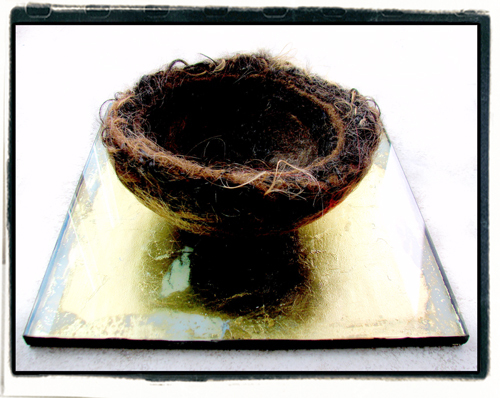 Ms. Mackay decided to create a bowl from hair, thinking specifically of a quaich, a Scottish bowl thought of as a communal cup (as well as a loving cup). According to A Gaelic Dictionary in two parts by Robert Archibald Armstrong, Cuach (Scotch, quiche, cup.) 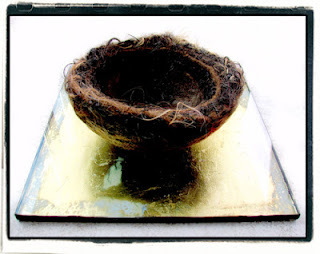 not only refers to a bowl, cup, or goblet; but also a nest, a curl in the hair, or a ringlet!1 A story from Highland Folk Ways by Isabel Frances Grant (1961) describes one quaich (pronounced quake) as having "a glass double bottom and within it a lock of golden hair, so that the owner could dink to his lady-love. "2 LOVELY! "Considering how each individual is intrinsic to the fabric of a society, I wanted to create a bowl -- inspired by a quaich." Ms. Mackay also attempted to trace the ancestry of those who contributed in order to "fully and truthfully express the complexity of Grand Bahamas' population." 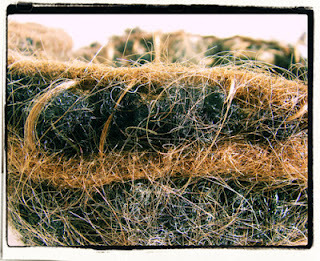 She named the piece "Roots" to reflect its associations to "heritage, hair, and connections."